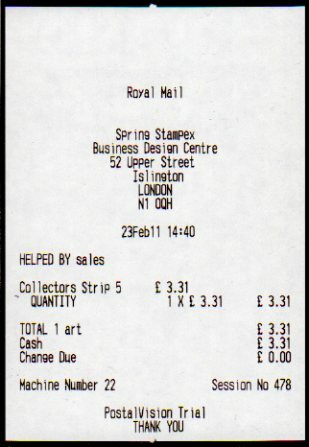 Royal Mail are trialling a new counter-based stamp printer, and one was installed at Spring Stampex in London last week. The "Branch Code" shows the year (002011), as for all event-based machines, and the machine number (22) is two digits rather than 1). Possibly because each strip is a single session (ie you cannot at present order 99 labels, the P&G maximum), the session number (002699) is 6 digits. The style of the figure 1 on the data line is most noticeably different. 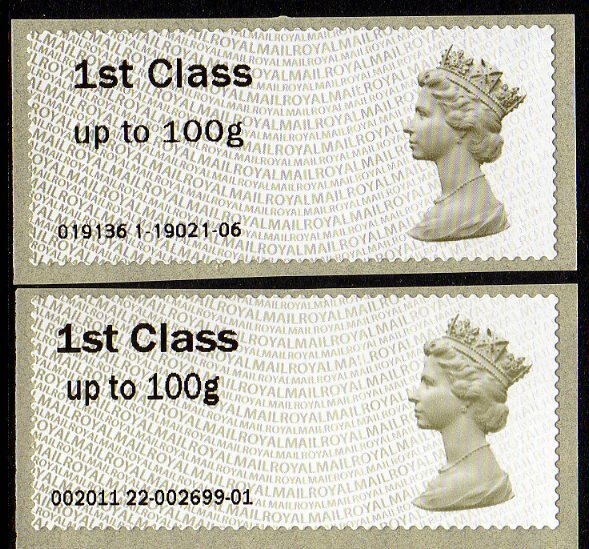 The base stamp, printed by Walsall with two phosphor bands, appears to be from the same stock.